I use pure cotton rope for my fenders, other rope(s),may be used if available and usually with additional expense. My standard size fenders are 3 1/2 inch diam. and 4 1/2 inch diam. "NEW SIZE AS OF MAY 2013" A 7.5" DIA.COTTON FENDER IS NOW AVAILABLE"
I can also custom curve your fenders to fit your boat. My transom fenders can be ordered straight, single curved or double curved, one diameter from end to end or custom tapered to your specifications. Please contact me on how to measure for transom fenders..!! Soak in luke warm water containing a white or clear, high grade dish soap (i.e. Ivory Dish Soap). Using your hands, massage the soap into the cotton rope. Do Not.. rub or scrub!!! … this will pull the cotton fibers out! Rinse in clean cool water. Repeat if necessary until fenders are clean. Rinse again to remove all the soap. Then hang to dry. Another product that works well is raw TEA TREE OIL. Simply use this cleaner like you would dish soap. TEA TREE OIL is also found in some other cleaners/soaps. Some stains may not come out. To remove these stains, CAUTIOUSLY dab with a mild bleach solution and rinse immediately! Ensure your fenders are completely dry and store them in a “cool and dry” location. Should you chose to cover them.. be sure the covering can breath to avoid possible mildew! Do not store the fenders long term in the plastic bags you received them in! TO DOWNLOAD A COPY OF THIS INFORMATION, PLEASE CLICK ON THE "INFO" TAB, AT THE TOP OF THIS PAGE. Regarding sizing fenders for your boat... a lot of different models were made "OR" restored by different manufactures or boat restorers, so to be on the safe side I suggest you go by the following notes to determine the size of fender(s) that would best fit your boat. I make a 3.5" and a 4.5" diameter fender, choose the one that does the best job of protecting your boat from your dock. Please note! My 3.5" fenders are closer to 4.0" than they are to 3.5" and my 4.5" fenders are closer to 5.0" than they are to 4.5"! Also ensure the diameter of the fender extends beyond the distance that the gunnel extends out beyond the hull and also the fender diameter should extend out beyond the splash rail and/or rub rail. To determine the "lanyard length", whether or not it is a straight lanyard or a looped lanyard, Start by fastening a piece of small rope to the cleat as you normally would...then pull the rope(s), over the gunnel to a point where you figure the "center" of the top of the fender should start. Pitch the single strand, "for a single rope lanyard" or the two strands "for a looped lanyard". Still holding the rope/ropes where you pinched them off, remove the rope from the cleat, straighten it out and give me the measurement from the point where you have the rope or ropes pinched, to the end of the rope/loop you removed from the cleat. This measurement will be your "lanyard length". STEP 1 - Using the same piece of rope you measured the lanyard length with, fasten it to the cleat as it would normally be. Pull the rope or ropes out and over the gunnel of the boat to a position where you feel the center of the top of the fender would be. Pinch the rope(s) off at this point. Measure from this point down to where the fender should end. Measure the distance between where you have the lanyard pinched off down to where you figure the bottom of the fender should come. BE SURE TO LEAVE AN EXTRA INCH OF SPACE FOR THE PULL-UP RINGS..IF THEY ARE BEING USED..!!! "This will be your fender length!" IMPORTANT... measure each fender location the same way and record your findings on a piece of paper. It is always handy to draw a diagram of each side of your boat and number each fender location. Note the fender length and lanyard length next to the appropriate fender location. "ANY PROBLEMS.. CONTACT ME AND I WILL ASSIST YOU"
If your boat requires curved fenders as seen on the Greavette Streamliners', please contact me directly for information on how to measure for "curved fenders". I will work directly with you in this case. I also make other fenders to meet specific needs of a particular boat design. For example I can custom curve your fenders to your boat. This custom curving is an additional $15.00 per fender. The "Dispro's" have a different demand as well, for their fenders. I make a cotton fender for the Dispro only. If you are interested in owning some of these beauties...please contact me directly. 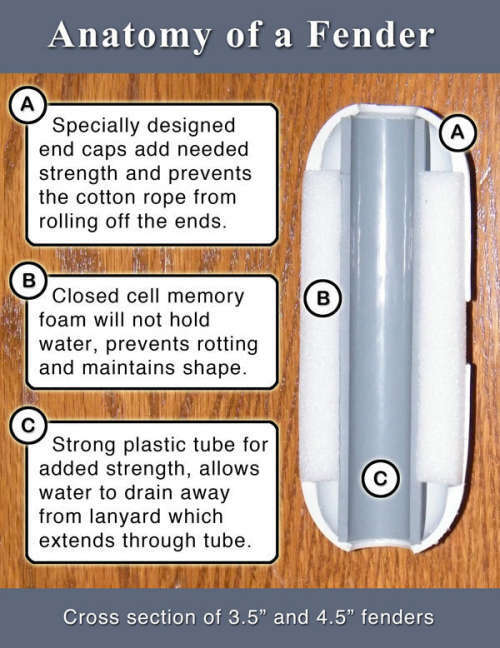 I sincerely hope this information is a great help to you acquiring a set of "Classic Rope Fenders" for your boat!! !